When I was back in the UK for a wedding last July, I looked in Stanford’s (London’s travel bookshop) for the guidebooks and maps we would need for onward travels. Not the easiest thing when you’re not exactly sure where the road is going and you can’t load up too much for space reasons. Failing to find an available book covering all the Balkan countries, I found a guide just for Albania. I had some vouchers that needed spending so I bought it. At that stage, we hadn’t thought any further than visiting Croatia, and Albania really wasn’t on our radar. It was later on when we met Florian and Nelya in Sicily in their VW Transporter, that Albania got mentioned again. They loved it. 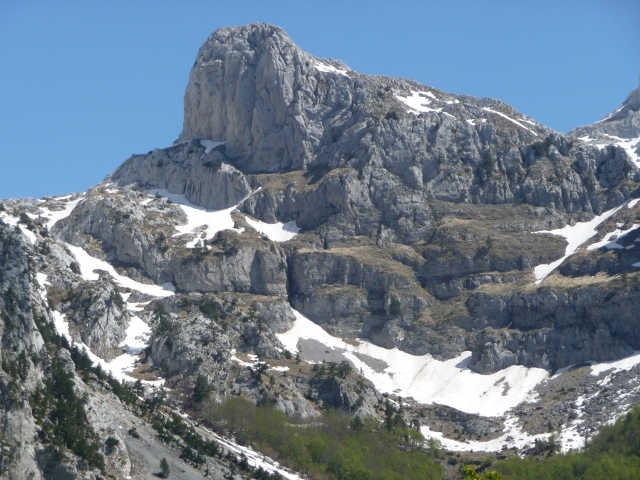 On reading our guidebook – Bradt’s Albania, written by Gillian Gloyer – clearly in love with Albania and Albanians herself, we were even more inspired to visit. After our trip to Tunisia, the route from southern Italy to Albania seemed the obvious choice. We’d met no other longer term travellers who had been south of Croatia, it just isn’t on the map of places people generally travel to, or only briefly to transit on the way to Greece. We didn’t know much about what to expect from a country that was so closed in by its Communist regime for so long that very few outsiders went there, and no Albanians came out. After the collapse of Communism and the pyramid selling schemes fiasco had plunged the country into anarchic chaos in the nineties, you didn’t hear any more. It’s the bad news that sticks. Those events are 14 to 20 years ago now, and in the meantime things may not be perfect, but it’s a peaceful country. We felt safe and very welcome. The people are genuine, very helpful and curious to know about you. They love all things English – football most of all. We’d been told that questions often get very personal and we skillfully deflected questions about earnings. Learning a few words of ‘Shqip’ brought many smiles, especially when we mixed up hello, goodbye and thank you. Some people then assumed we could understand the directions and instructions they rattled off at top speed. It’s amazing how much you can communicate with simple hand gestures and miming too. An Albanian guide we met in Gjirokaster said that Albanians do three things freestyle: driving, parking and building. There were no private cars under Communism, and then all at once this restriction was removed, and everybody evidently got driving lessons from Greeks and Italians. Mercedes are the order of the day, they will withstand the poor roads better than anything, lots of VW Transporters too. And big 4x4s on foreign plates, and sometimes with no plates at all. The driving was certainly no worse than we’d seen in Sicily, but the elaborate roadside shrines – often fully engraved headstones with pictures of the deceased – perhaps tell a wider tale. It’s the blend of religions and cultures that’s captivating – mannerisms, furnishings and words we’d grown familiar with in Tunisia – here in Albania. Now in south eastern Europe, as in North Africa, we are seeing the touch of the Ottoman Empire that ruled here for so long and spread its influence so wide. The different peoples that have come and gone, settling in different places. The blurring of ethnic groupings, the borders not quite fitting – more political than human – all those things that make this area a fascinating place to visit, but which have also fuelled so much turbulence over the centuries. Ilva, who we met on the way to Korça, spoke about the zeal of her people. Their ingenuity in overcoming the obstacles of the past. We have heard about the difficulties of emigration, the loss of highly trained individuals, and in a country where you have to ‘buy’ a job, it’s money not skills that count. But how to overcome the inevitable problems this causes? Economically, it’s on a slow upward path. The infrastructure, laid low by years of neglect, is being worked on, but it will be years before it’s completed, and many roads are still difficult. Although the main tourism is, as usual, focused on beach resorts, the scope for adventure tours and ecotourism is great in the rugged interior. As the pace of development increases, the things that are so charming about the country could so easily be lost. We saw in Tunisia how local people are changed by mass tourism, losing that genuine welcome. The freestyle building along the coast in particular is in danger of ruining the beauty so many come for. We saw more evidence here of overseas intervention than we saw in Tunisia – Oxfam projects, the US Peace Corps, and Dutch development workers. 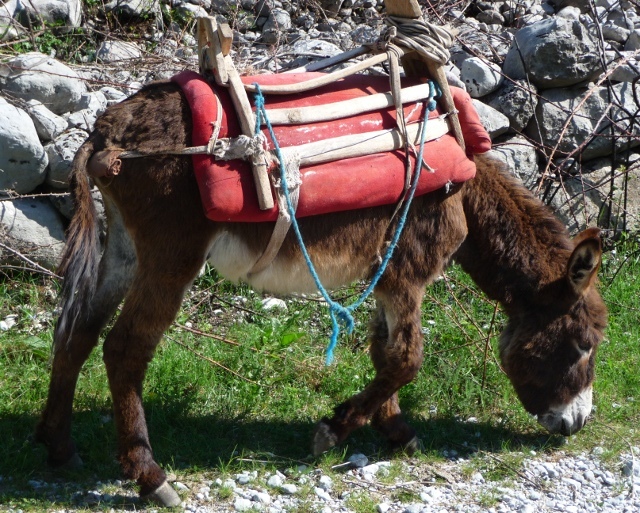 Charming as the traditional ways are, using donkeys for transport, freight and ploughing for example, it also points to poverty. The small farmer would far rather have a car or a tractor or both, and running water would be great too. In Albania, there are few signs because everyone who needs to know where somewhere or something is already knows. Or people can ask can’t they? Yes, there is often someone who can speak English, or Italian or German, but not always. Few restaurants have menus. They can tell you what they have. Of course it would be more convenient if there were more signs and menus, but we’d have missed out on lots of experiences and interesting misunderstandings if there had been. A restaurant with a menu in five languages with pictures of the food is a turn off. Better the back street diner where you get invited into the kitchen to look at what they’ve got under various pan-lids, or get to peek in the freezer, or ask them to give you what they have and hope for the best. It won’t cost much, and it will be delicious, even if it’s just eggs and sausages. 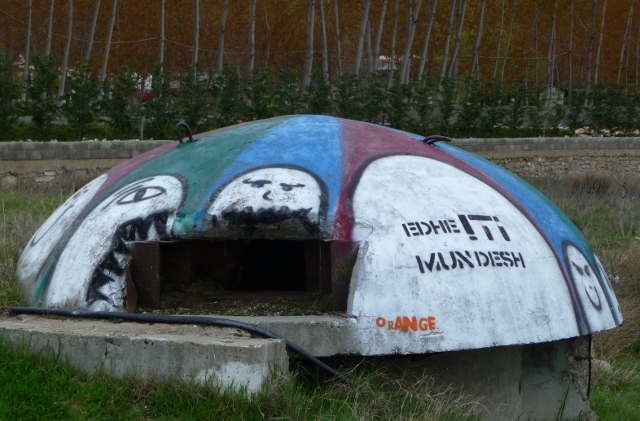 There are still millions of bunkers dotted around the country – concrete evidence of the paranoia of a Stalinist dictator. 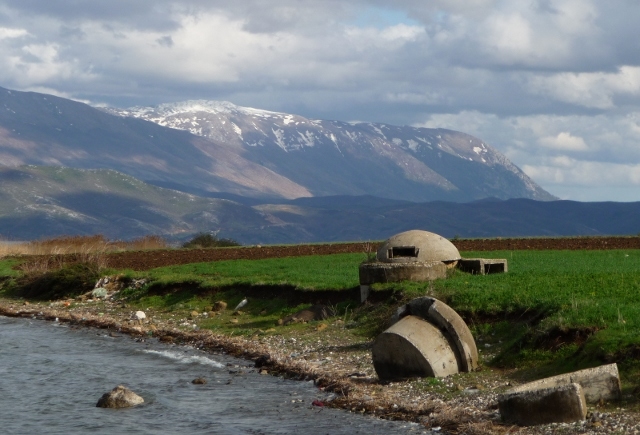 Almost impossible to destroy, there is estimated to have been a bunker for every four Albanians (around 700,000). Then there is that air of secondhandness – the buses mostly acquired from other European cities, the myriad minibus taxis and vans with liveries ranging from German school buses, Swiss Golf shops, and even ex-British minibuses with the doors on the wrong side so the passengers have to board in the middle of the road … Petrol pumps still in Deutschmarks or with out-of-place Scandinavian Statoil branding. The country exceeded our vague expectations on all fronts. From the wild mountains to the lakeside to the coast, the landscapes were awe-inspring. Challenges lay not where we expected – as well as the lovely people we met, we always found good places to eat and sleep. Any frustrations lay in finding the right road and when we did find it hoping that it might be good enough to take us where we were going. Albania may hold its cultural heritage dear but doesn’t realise that what it has is special – all the more precious because so much has been lost during the turbulent past. 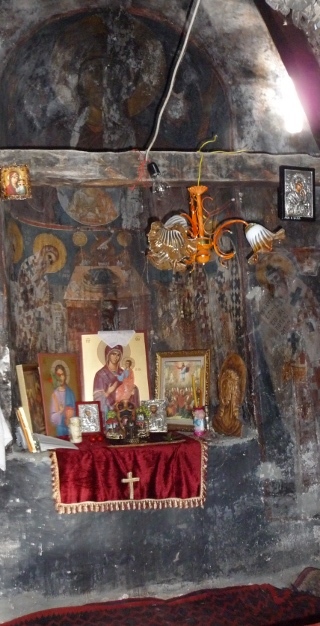 Hunting for the person with the key for tiny churches with magnificent frescoes that anywhere else would have tour buses outside, both here and in Macedonia, made for a not-unpleasant diversion and we are rarely in a hurry. Refreshing to be such a long way from the trappings of tourism, we felt like the discovery was ours alone. Writing this just three days after leaving the country, I still have such a warm feeling about it. We’re so glad to have had the opportunity to spend a little time there. It’s been a fascinating three weeks of jaw-dropping mountain scenery, incredibly bad roads, amusing insights, kind-hearted people, perfect wild camp spots and some exquisite meals. It’s erratic and it’s eccentric, and it’s charming. If you ever pondered visiting one of the most unusual countries in Europe – don’t delay, it’s changing fast. 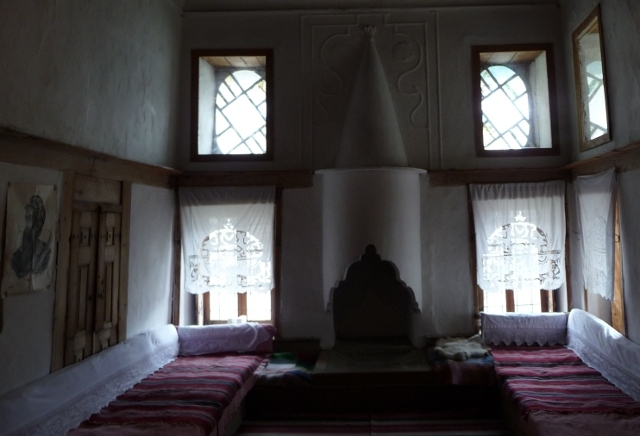 This entry was posted in By Country - Albania, Personal stuff, Travel stuff, Uncategorized. Bookmark the permalink. Ellie, this is wonderful, what an amazing account of a lesser known country, I have loved travelling around it with you both, safe journey on and can’t wait to see where you will take us next:-) I have put this out on twitter today, you may have some more visitors tagging along so make room in the van!